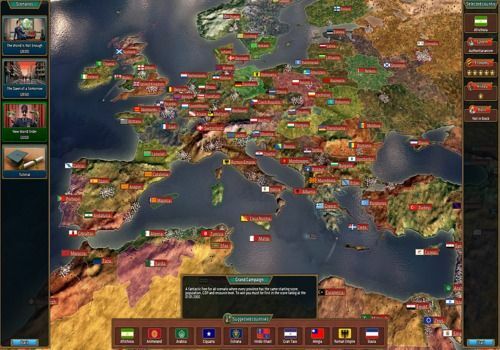 Expected by a large number of players, passionate about geopolitics, Realpolitiks, the large-scale strategy game, will be released on February 16, 2017. In the meantime, get your hands on this impressive demo. This game takes place in the modern world, so you will have the opportunity to take command of the contemporary country of your choice. You will have to face many real or fictitious scenarios that will undermine international diplomacy (disintegration of the EU, third world war, etc.). Realpolitiks will also ask you to know how to react in the event of natural disasters, financial crises, epidemics, or terrorism. The goal will be to become a global superpower and to do so, you will have to use your economic and military power. You will have many tools at your disposal (espionage, technologies, colonies, etc.). You can choose from three political regimes (democracy, authoritarianism, totalitarianism), which will determine your relations with other countries.